Within hours of landing in Albuquerque, it became clear that almost everyone in New Mexico is an artist. Or has artistic hobbies. Or champions art vigorously. 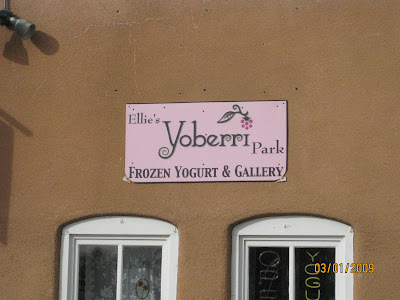 Even the frozen yogurt place is a gallery. As one gallery owner put it, “This is the most supportive artistic community you’ll find.” He wasn’t exaggerating. Of course, it doesn’t hurt that Santa Fe (45 minutes away) is the third largest art market in the US. Or that artists can actually make it thanks to the affordable cost of living. ($30,000 is “an abundant salary,” we were told.) But there’s more to it, and I’ve been ruminating on just that. One visible clue is the state’s film incentive program, which offers rebates, loans and tax breaks. Not surprisingly, it’s made the state a hotbed for film and TV production. “We love filmmaking in New Mexico,” handmade signs read on the roadside. Apparently 28 films were shot in Albuquerque alone in 2008. While some politicians have been critical, the population remains enthralled. But perhaps the best example of this artistic proclivity is the Golden Crown Panaderia, which we visited the very first day. 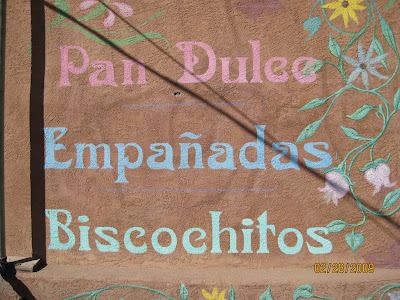 Located in the Old Town section of Albuquerque, this tiny neighborhood bakery is a single-father-and-son operation that is guaranteed to make an impression – emotionally, olfactorily and gastronomically. 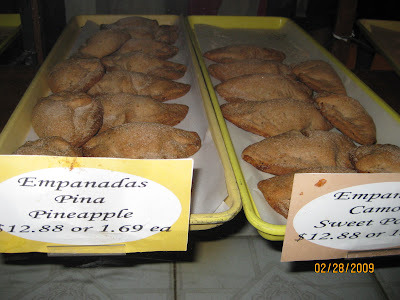 The first thing you notice is the wonderful smell (from the fruit empanadas), which prompts you to inhale deeply and soften a bit. Not that New Mexicans need that. But this overworked urbanite did. Then we were handed a free biscochito, a crispy butter cookie flavored with anise and cardamon. It's the endearing "welcome bite." The father, Pratt, is a former CPA turned passionate baker. 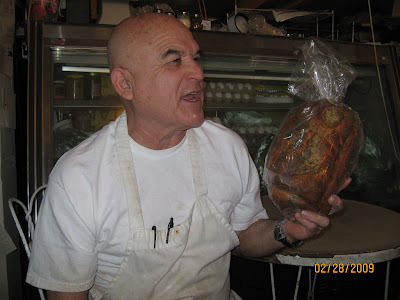 His signature green chile bread, which he’s holding below, has been featured in the New York Times, Gourmet Magazine and the Food Channel. It’s spicy. It’s rich (thanks to the parmesan). And it’s amazing. A loaf is currently sliced and frozen in my freezer, per Pratt’s detailed instructions. Salivating? Order it online here. Having a famous specialty bread is just the beginning, though. The exuberant, indefatigable, 70-year-young Pratt also makes bread art. What’s that, you ask? 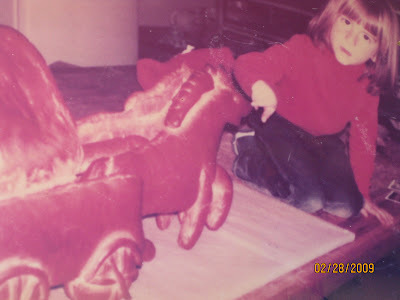 Well, it’s making a horse and carriage out of bread for his son’s birthday. (See old photo below.) Or a bread turkey for vegetarians at Thanksgiving. Or bread busts of people’s heads. It was fairly astonishing to see all that one could do with bread. 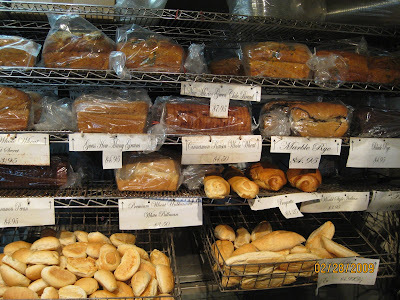 Pratt mixes various dough to produce color variations (yes, all skin types are possible) and carefully orchestrates how the bread rises in his massive oven. He’s currently working on a bust of Jay Leno, he shares. Listening to this delightful raconteur, I felt my face hurting from smiling so much. I also noticed strangers striking up conversation and the convivial atmosphere infecting everyone. This was truly the “golden crown” that started the trip so auspiciously. How did I feel around all this warmth and creativity? The word would have to be inspired. We talked to a guy from Ohio who decided to make custom water fountains – because he thought he could. 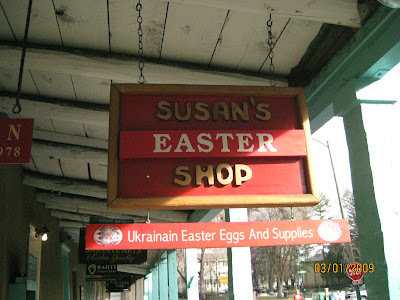 We spent time in a shop specializing in Ukrainian Easter eggs. Nothing is too out there in New Mexico, and perhaps most importantly, there is the feeling that you can try anything because no one will judge you. Soon my boyfriend was pondering the large-scale mobiles he’d build in the studio/barn, and I was listening to a female poet on New Mexico public radio, thinking, “I bet I could write a lot of poetry in a place like this.” In the dramatic high desert setting, with colossal mountains and endless views, it seemed easier to reflect on life. I guess that happens any time you can see for hundreds of miles and realize your own itsy bitsy role. Thus, my first and strongest takeaway from New Mexico is that the possibilities seem as wide open as the environment and as optimistic as the people, who (teaser alert) would go on to eclipse Austinites in the battle for “Most Friendly.” Yes. Believe it. Who won “Most Weird”? That one’s going to a tiebreaker round, folks. Stay tuned! Hey, thanks for visiting us! 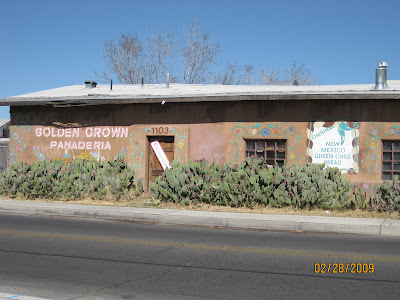 The Golden Panaderia is a block and a half from my house -- great to see some nice shots of it online. 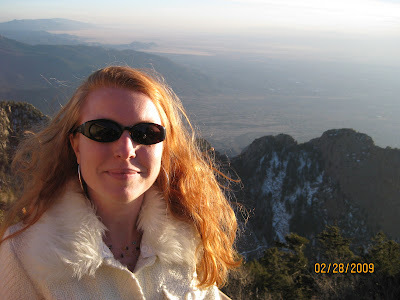 I've never been to Albuquerque, but now I want to go!